The greatest growth in commuter journeys from the country to London is being seen on the outskirts of the traditional commuting belt. Increasing numbers of buyers in counties such as Suffolk and Somerset are now acquiring their main residence in what have more traditionally been second home locations, and embarking on a long distance commute. The analysis, based on season ticket sales published by the Office of Rail Regulators, shows that the greatest increase in commuter journeys were seen not in the traditional commuter zones. Rather, the biggest growth was seen in Worcestershire and Shropshire (+54%), followed by Suffolk and Norfolk (+39%) and Somerset, Devon and Cornwall (+28%), areas where prime property prices have risen by up to 6.4% in the past six months. By contrast, in the fifteen counties and unitary authorities of England where commuting is more established, season ticket journeys rose by just a fifth. ‘London workers have traditionally been a major force in the property market in the Home Counties,’ says Lucian Cook, director Savills residential research. ‘In Essex, Kent, Surrey, Buckinghamshire, Hertfordshire and West Sussex London escapees have consistently accounted for more than half of all buyers of prime property over the past eighteen months. 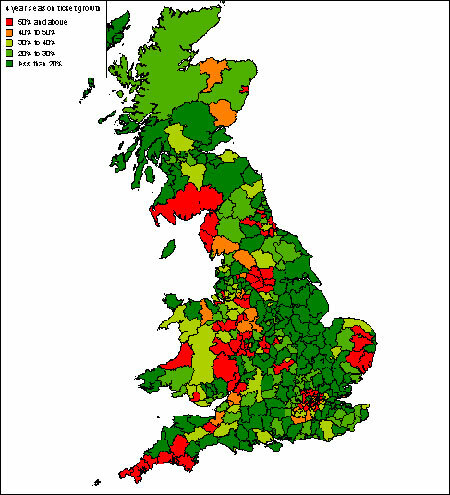 However, over the recent past some have found these traditional commuter counties effectively saturated. In the South-West the figures are much lower, with the exception of Somerset where such buyers account for 17% of the market. However, the London effect is still very much in evidence across the region though these buyers will often plan to work from home, with the occasional trip to London. This is reflected in the fact that in Devon and Cornwall a quarter of buyers of prime property work from home, and the number of season ticket holders has risen up to fourfold, albeit from a low base.